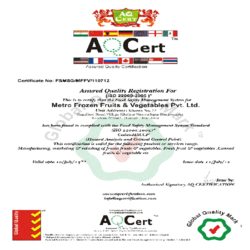 Established at Roorkee (Uttaranchal-India) in the year 2005, we Metro Frozen Fruits & Vegetables Private Limited, an ISO 22000:2005 certified company, are one of the trusted manufacturer, exporter and supplier, and wholesaler of frozen fruits and vegetables to almost all parts of India, Australia and Middle East. We use the latest technology for processing, testing and packaging of our fruits and vegetables. To maintain quality in every aspect, we take care right from the procurement of fruits, canned fruits, canned peas, canned pineapple, frozen french beans, frozen peas, frozen spinach and vegetables to the mechanized packaging of our fruits and vegetables. Our product range includes Frozen Vegetables, Frozen Peas, Frozen Corn, Frozen Mix Vegetable, Frozen Okra, Frozen Baby Okra, Frozen Diced Potato, Frozen Spinach Cubes, Frozen Carrots, Indian Pickles, Mango Pickle, Frozen Fruits, Frozen Strawberry, Frozen Litchi, Dehydrated Vegetables, Dehydrated Onions, Dehydrated Carrots, Dehydrated Coriander, Dehydrated Spinach, Dehydrated French Beans. We procure seasonal fruits and vegetables, which are procured from the best cultivation zone and are of best quality. These fruits and vegetables are processed in the best manner so that these fruits and vegetables can be relished in every season. Special care is taken to keep intact its natural taste and flavour so that these food items are widely demanded in the global market. With our sophisticated processing and packaging process we have well established ourselves in the market. In our quality endeavor, we strictly maintain quality aspect in each and every stage so that fruits and vegetables offered are of best quality. We strictly adhere to food industry standards, for our entire variety of fruits and vegetables and employs strict quality control measures for delivering qualitative fruits and vegetables to our valued clients. Our vertical integration allows us to maintain the quality of products we provide to customers from field to table. We have good management practice within the plants using predictive maintenance schedules to keep operations running smoothly. Our commitment assures us with consistent quality in our products and we are focused on maintaining the highest quality standards. We comply with all guidelines and regulations for food processing, ensuring that all products meet all health and safety requirements. We process seasonal fruits and vegetables so that best quality is offered to our clients. Frozen Vegetables – We offer frozen peas, frozen corn, frozen mix vegetable, frozen mushroom, frozen strawberry, frozen okra (lady finger) and other vegetables. All our vegetables are season’s best and have natural taste. Fruits & Pulp – We offer best quality pulp of mango, strawberry and litchi which are sourced from best cultivation zones. Canned Products – The variety of canned products that we offer include canned mushrooms, canned peas, canned corn, canned fruit cocktail, canned pineapple slice/ cube, canned cherry and canned litchi. Fruits and vegetables are well processed with the latest technology so that all their nutrient values & taste are preserved. Fresh fruits and vegetables, when harvested, continue to undergo chemical changes which causes spoilage. Freezing is immediately done after harvest, at their peak degree of ripeness. Fresh fruits and vegetables contain enzymes that cause the loss of color, loss of nutrients and flavor changes. So these enzymes are inactivated to prevent such reactions from taking place. To protect the vegetables from enzymes, blanching is done. Blanching is the exposure of the vegetables to boiling water or steam for a brief period of time. It also helps to destroy microorganisms on the surface of the vegetable. For proper freezing of fruits and vegetables we follow I.Q.F process. Individual quick freezing is a freezing technique by which we freeze our fruits and vegetables. In this freezing process the fruits and vegetables are frozen at -40°C and are stored at -20°C. These frozen fruits and vegetables should be used within the suggested storage times.